I have a young plant of Dracula I got off eBay earlier thus summer. 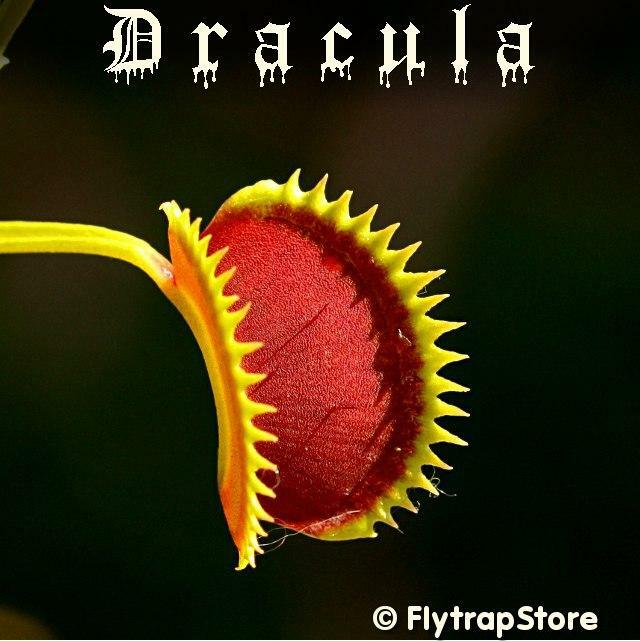 The issue I have is that the traps don't look like typical Dracula...do young plants have normal teeth and what age do they start to show proper characters, or have I been sold a dud? 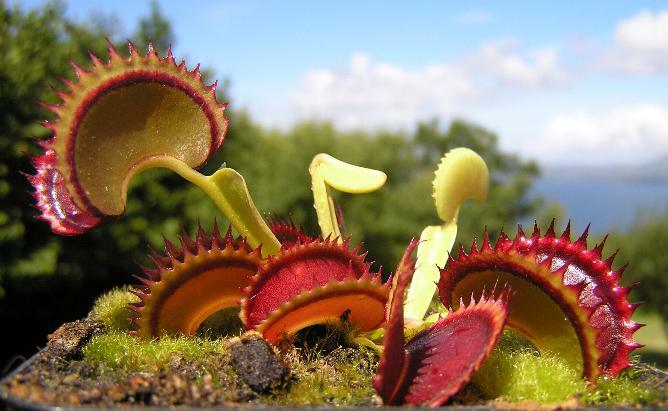 Short-toothed Venus Flytraps often have thinner, longer teeth (marginal spines) when they are young, and develop the "dentate" characteristics as they mature. 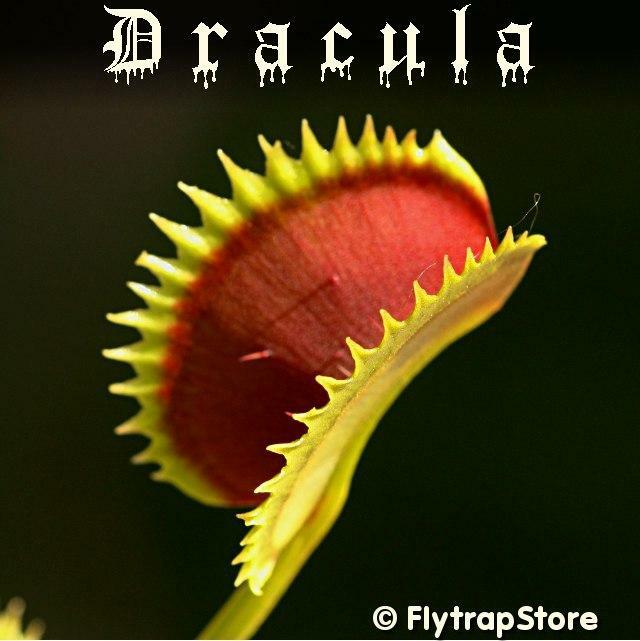 Regarding Dracula, the coloration that the plant is sought for, made famous by a few very nice photos, can be as capricious as it is for so many other Venus Flytraps. I have grown Dracula and UK Sawtooth II of approximately the same level of development and maturity, side by side in identical (and controlled) lighting and conditions, and the UK Sawtooth II ended up looking more like Dracula (the ideal version in the photos) than Dracula itself. 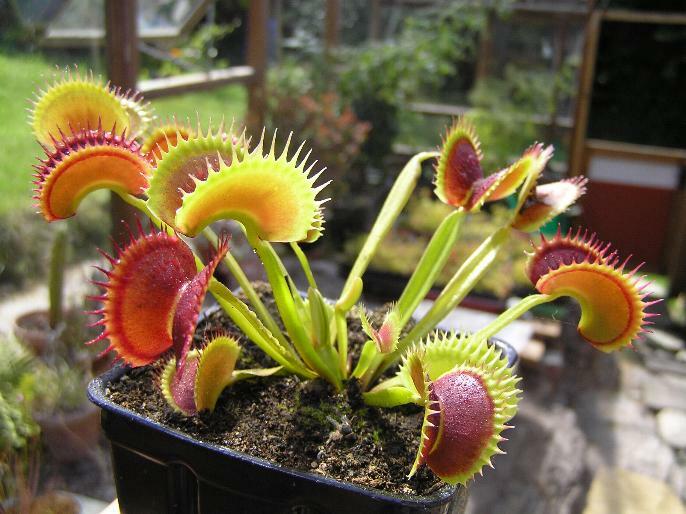 Edited and added weeks later-- My comments in this post may be inappropriate, as I was possibly (perhaps likely) growing a Venus Flytrap that was not a genetically identical clone of the original plant, but another plant with some visibly different characteristics that was distributed under the same name. I think there are a lot of dubious Dracula's doing the rounds these days. 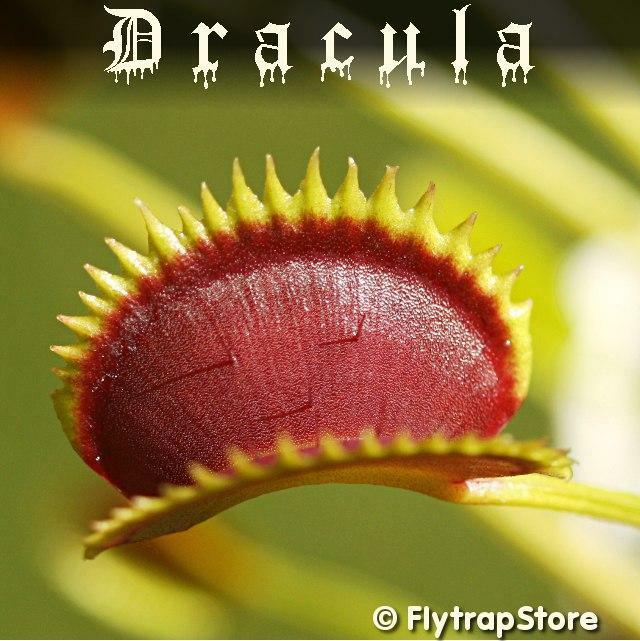 With any venus fly trap the characteristics can vary due to growing conditions but generally Dracula's character will show in any plant of the clone over about an inch in size. 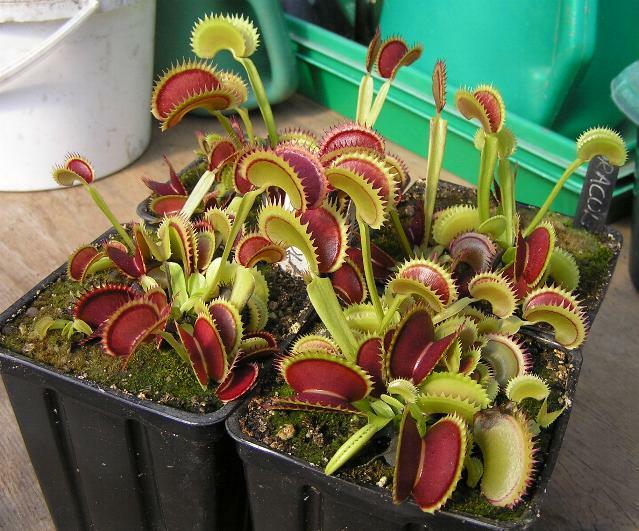 I have 6 pots full of mature plants in my collection (all from the original Dracula plant) and all bar a few of the small new divisions have the deep colour and characteristic traps. I'm in a hurry this morning but if I get time later I'll snap a pic and add it here. My experience is the same as Steve's with regards to younger plants developing more "dentate" characteristics as they age. Given some time to mature, I'm sure you will see the characteristic teeth. In my personal opinion, Dracula is an OK plant, but not one of the better short-toothed, well-colored varieties. Like Steve, I think UK Sawtooth II is superior, as well as Jaws (the original clone from Leo Song, Jr.). I find plants out of tissue culture take 2 or 3 years to recover and grow normally, all my plants are from natural divisions and have never been tissue cultures. I also grow UK sawtooth and Jaws but the Dracula's always put on the better show me. I dont have dracula myself, its just not unique enough for me. 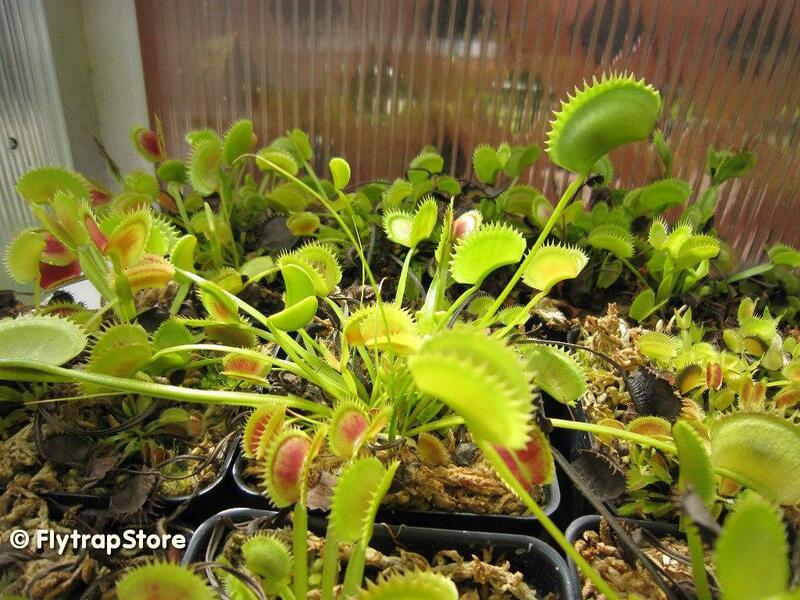 One thing I see from the pictures is it has a very curved midrib between the traps. I dont see that feature on yours Stephen, did you get it from a reliable source? Trev, when were those photos taken? My adult Dracula plant currently looks quite different, with long leaves. During the late fall and winter months, my plant looks more like those in the photos. 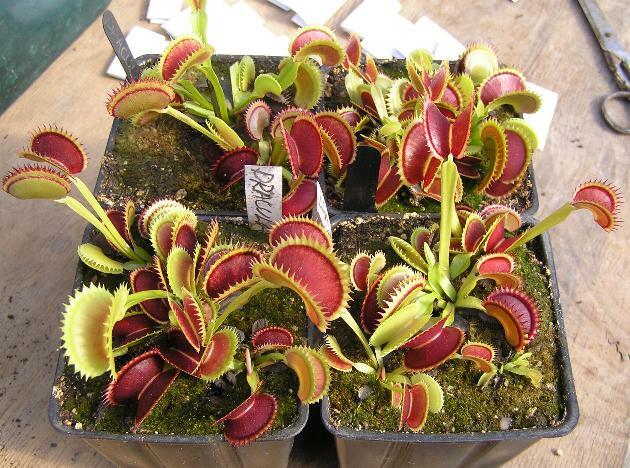 I got it from highernewhamcarnivores, I think Gary said he imported them from USA and they're from tissue culture. From Mart Miller, is that you mmlr38? I took those pictures today. Sorry Stephen, in my opinion that is not Dracula. I've never seen teeth that long on any of mine, I guess it's possible it could be the result of being tissue cultured but I'm doubtful. Are those your sale size plants Trev? 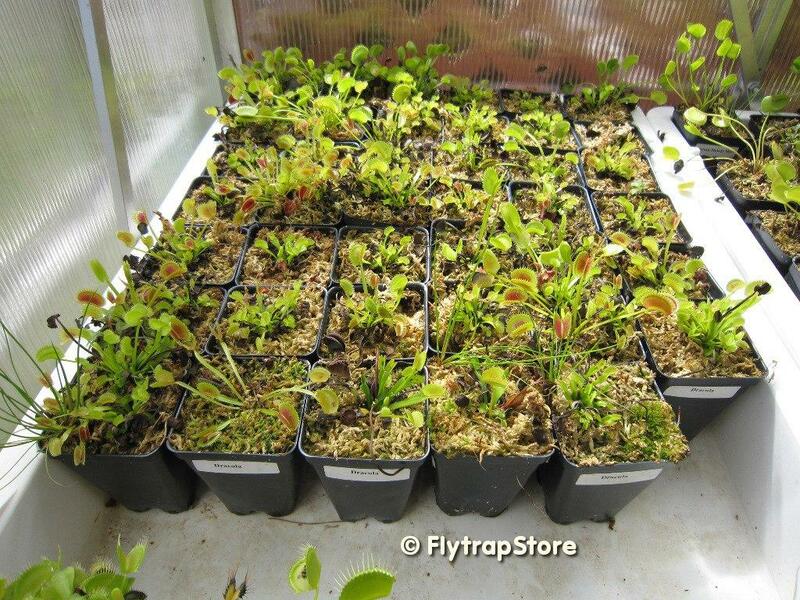 We do the majority of our propagation through tissue culture. In my experience, plants out of TC usually resume normal growth within the first growing season. Yes, that's me (Matt Miller). I sourced my original Dracula from a very reliable grower in the EU with whom I've had many successful exchanges. I also sourced another plant from a different grower. Both plants look the same. So unless there was some labeling error somewhere along the way, that is the real deal. 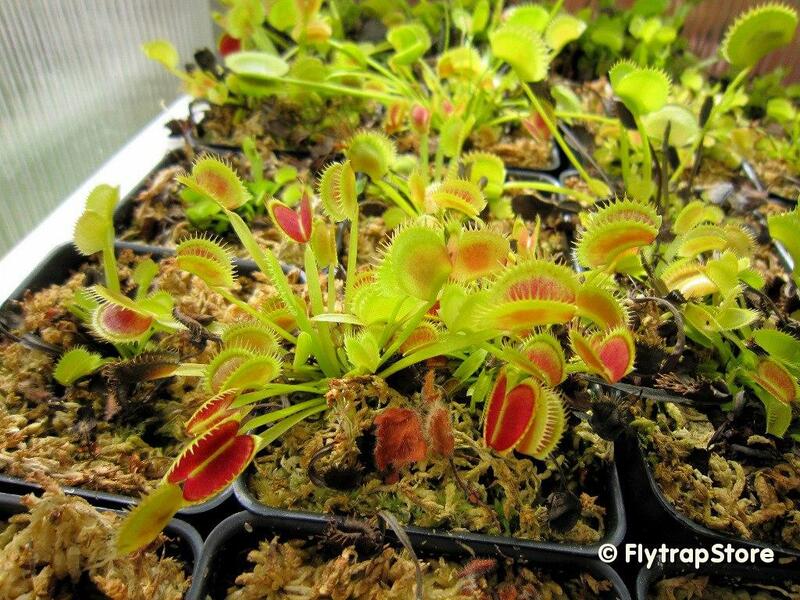 The teeth on the one trap do look a little long, but the plant is still small, so that's not extremely unusual (as Steve already mentioned). Well Gary sent me some pics of similar sized plants which look very different, and has offered to replace, so perhaps there was just a mix-up? That could very well be. Mistakes happen from time to time. 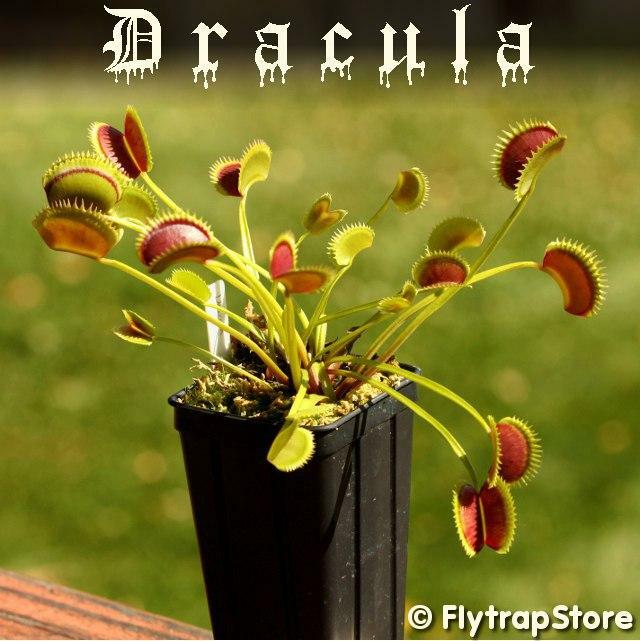 But I can't say for sure that the plant you have now is not a Dracula. It's too small to say and small plants can look quite different than mature plants, especially ones recently out of tissue culture. Giving it a year or so to grow out will make it easier to tell if it's a Dracula or if it had been mislabeled. I'm sorry Matt, to me that is not Dracula. Somewhere back down the line someone must have mixed plants up. 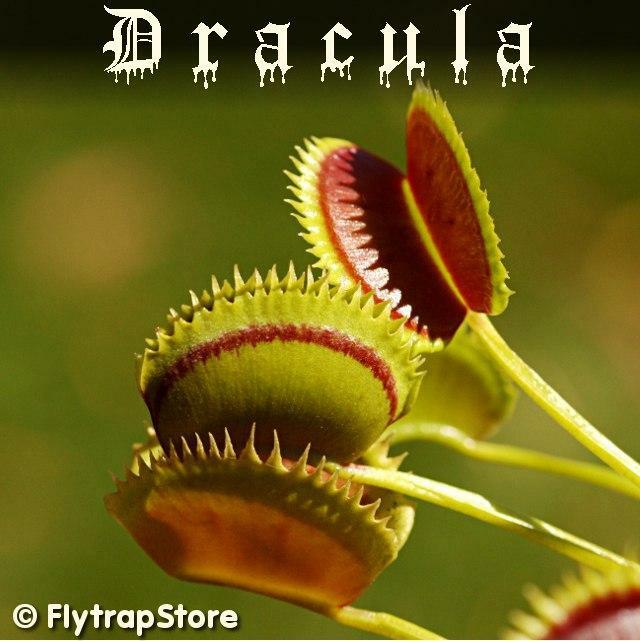 The genuine Dracula is mostly rosetted with some upright traps all year round, the traps are arched, the teeth are dentate but with some small side dentations on larger traps, the trap colour develops to a deep red including the teeth and the outside of the traps has a red band. My greenhouse temperature ranges from extreme winter low of minimum -7*C to summer maximum of 44*C, usual range is more like 0*C to 40*C, average summer day temp is 20 to 30*C. Full sun. Peat and perlite media. I have two Dracula plants that are just getting to a decent size now, I think it's a lovely looking VFT. I have also Dracula and i'm uncertained. I get my first Dracula in the year 2009. 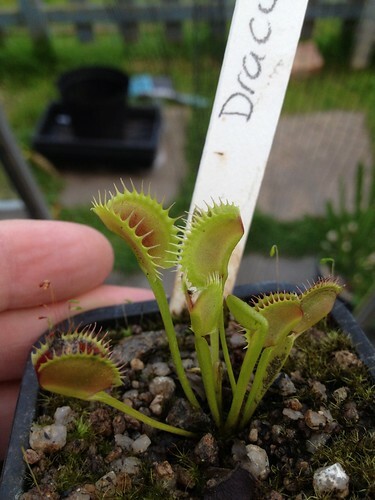 This plant Dracula 1 grow at the Moment mainly upright, with traps Looks like dentate, some are arced and some have a lightly red band outside. I have spread them as Dracula to many growers, because i thought its Dracula. Years later i get another Dracula from a Italien grower in a swap. This plant is still small. I compare them today and i'm afraid to see differents. The frist Picture is from Dracula 1 and the other is Dracula 2 from the Italien grower. Did some of us are crappy? If it so, did we can to retrace wich guy was it? Thomas, The 1st picture is the fake. The 2nd picture you posted is the true Dracula. Glad to see someone's got one. What about these ones? Pics aren't great but good enough I hope. Hard to say for sure from those pictures but I would be pretty sure the first 2 are the fake, the second 2 look more like the real thing. Awful lot of fake Draculas out there. Thanks Trev. Received the one from you yesterday in great condition. Will grow it next to the other clone to see how they compare. About all the discusion about the wrong Dracula. I will label the wrong Dracula as plant "fake Dracula". Ist still a nice plant. I think I might know what's happened here; there's a rare clone called "G14 X Dentate" which was the only other plant I kept from the original seedlings that Dracula was selected from. 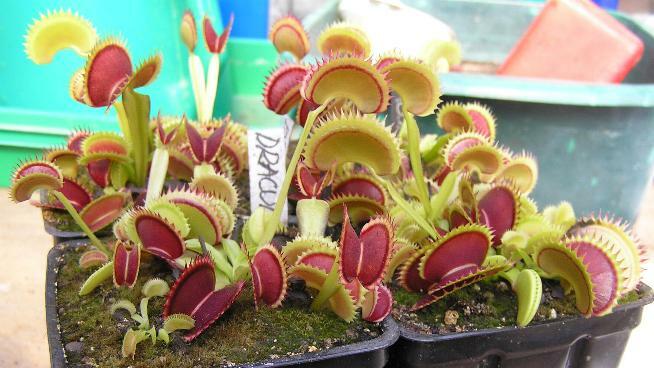 On my photo links page and Bobz's CP photo finder site, Dracula is listed along with the parent plants in brackets: Dracula (G14 X Dentate), someone may have misinterpreted this as meaning they are the same clone and relabelled their plant as Dracula. I modified the "Dracula" listing in the CP Photo Finder to make Trev's point clear and added a link to this thread. Part of my purpose in creating the CP Photo Finder was to allow people to compare photos to help verify whether their plants looked correct. There are numerous clones being grown and distributed that are not identified correctly. This results in a big mess.